Hannah Bartlett qualified as an optometrist in 2001 and received a PhD in ocular nutrition in 2005. She was appointed as a lecturer at Aston University in 2007, and is currently a reader in optometry. 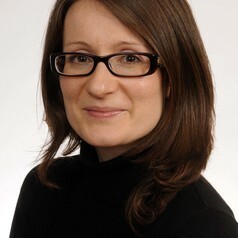 Her research is broadly based around the role of nutrition in ocular disease, but has included the development and evaluation of ophthalmic instrumentation, clinical trials, and investigations of the psychology of nutritional behaviour, and the impact of educational interventions on patients and practitioners. Hannah has taught on all levels of undergraduate and post-graduate degree programmes and has supervised several PhD students. She achieved a Master’s in Education in 2017 and is a Senior Fellow of the Higher Education Academy.